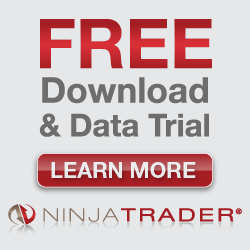 Start a free 30 day trial by clicking a Black box just below. Subscribe with PayPal by clicking a GOLD box. Take a look. We think this is way different! After years of looking at complex chart setups and trying them, most are not Dazzling You With Brilliance....they are doing something else. You need some victories. You don’t need hype. You need some simplicity, not complication. We have taken the simplest indicator of all, THE MOVING AVERAGE and given it power you have not seen anywhere. At least we couldn’t find it after searching extensively. It impressed us so much, we have a US PATENT PENDING on it. 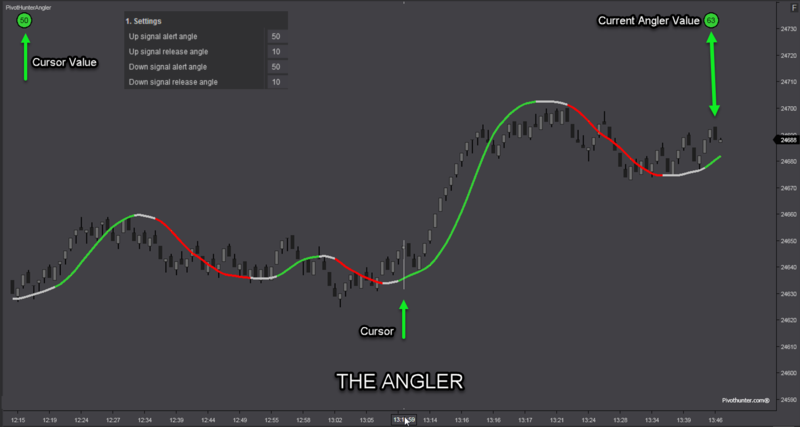 Having the ability to change the color of a moving average based on YOUR preset angles is revolutionary. 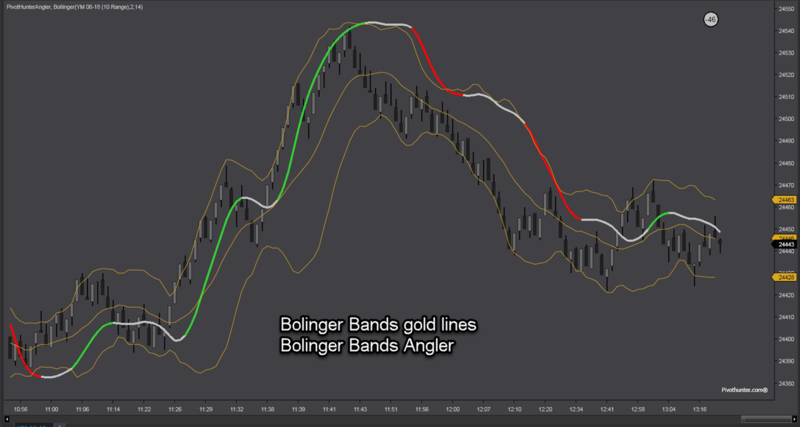 When these alert values are reached, the Moving Average Line changes from the neutral color you have chosen to the color you have chosen for up or down. After any initial alert angle is reached, the Line will stay that color until the specified release angle is reached and the Line color will change back to neutral. All of these alerts can be accompanied by a sound alert of your choice. Makes monitoring multiple charts easy. The usual data sources can be selected: Open, High, Low, Close and some you may have never used. Example: That one price during the life of the bar (candlestick etc) that accumulated the most volume, commonly called the Point of Control (POC). We have developed a couple of our own you can use. One uniquely measures order flow at three levels and combines all 3 into one indicator we call the ThreeKings. Another measures price momentum at three levels and combines all 3 into one indicator we call ThreeCops. But, hold onto your caps. 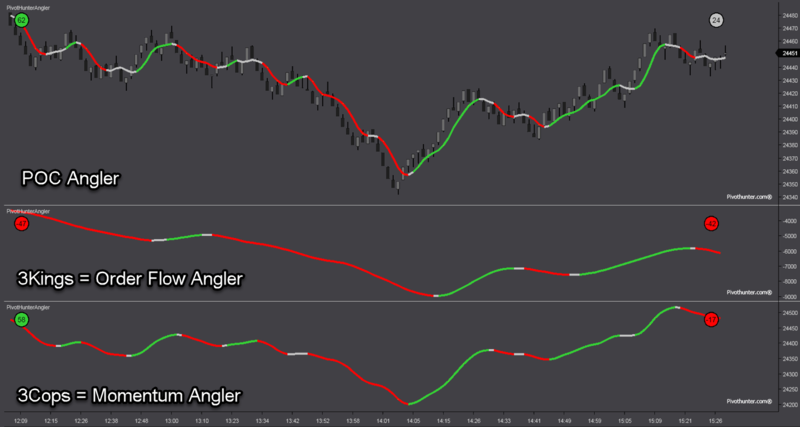 You can also select any indicator that draws a line and apply Anlger attributes to it. 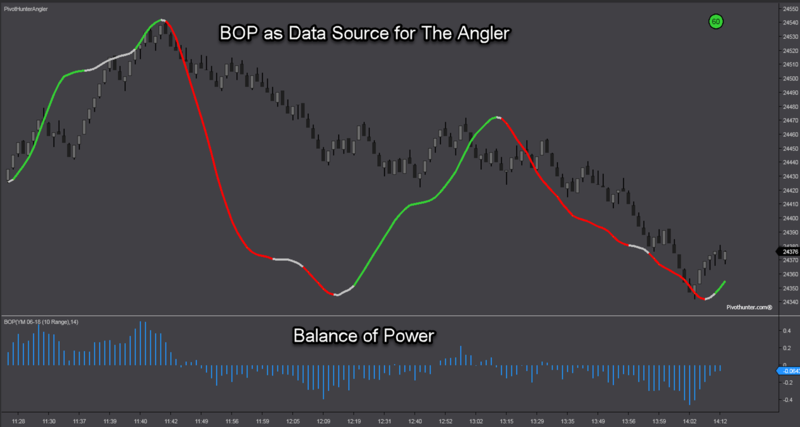 BOP, Bollinger, Dochian Channel etc. 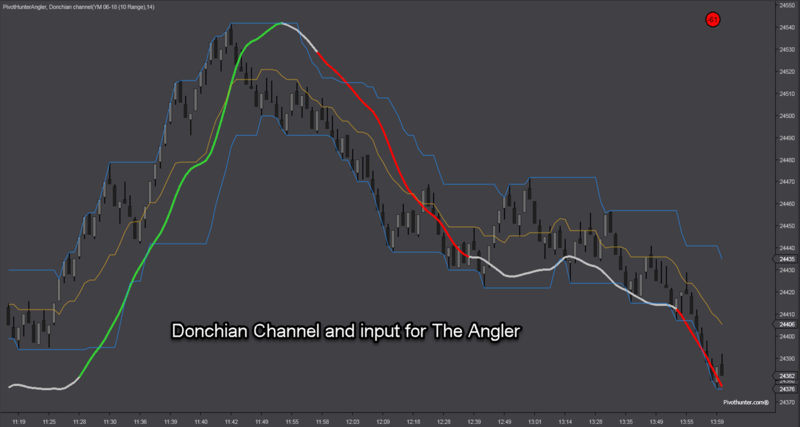 So, what about using The Angler to look at the POC, Order Flow and Price Momentum all at the same time on the same chart? Piece of cake. What about waiting for all 3 to be in agreement? Good idea. Setting the POC at 50:10 for the alert and release angles so you can get a serious angle before the signal is triggered AND setting 3Kings (order flow) and 3Cops (momentum) at 20:5 to get a quick read on when both order flow and momentum are starting to change. Good idea. Trading can be dangerous. Whatever settings you use are strictly your decisions. Using any of the ones we suggest remains your responsibility as to how you react to them. Sim trading is always a good idea when trying anything new. SECOND. 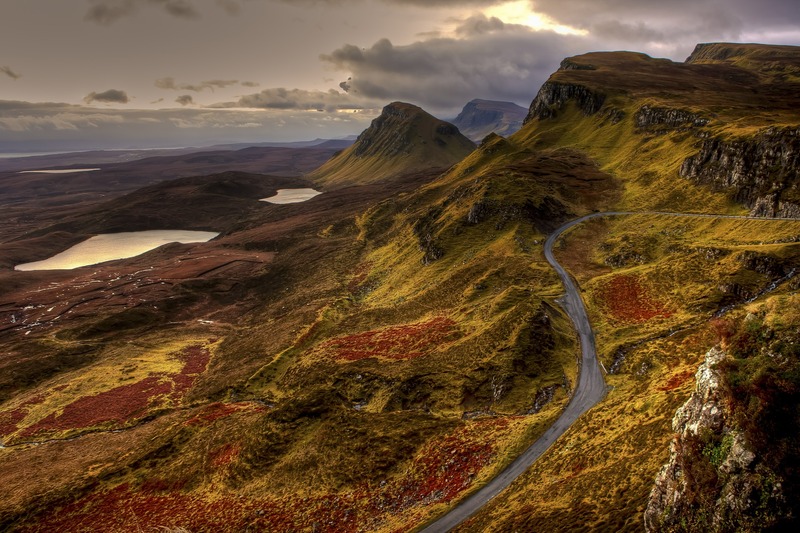 WHILE THE INDICATORS ARE SIMPLE IN LOOKS, THEY ARE EXTENSIVE IN DATA PROCESSING. PLEASE GIVE THEM AMPLE TIME TO LOAD. Come into our charting room each trading day morning from 9:00 to 10:00 ET. We will show you how to set up your charts with our 6 indicators. Answer questions. When you register for any level you will automatically get an email with the link for joining each day. Cancel registration any time.